President Akufo-Addo today [Thursday], took a rather unusual subtle jibe at members of the National Democratic Congress [NDC] minority in Parliament, when he suggested that they no longer recognize the Founder of their party, Jerry John Rawlings. The President made the observation when he appeared before the House to deliver his second state of the nation address since he assumed office. While acknowledging the various dignitaries present in the chamber, the President mentioned the name of former President Jerry John Rawlings, and that was accompanied by not some cheers from the minority members. 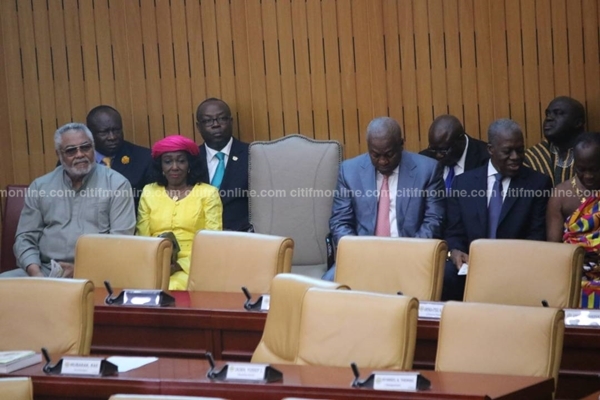 However, when Nana Addo acknowledged the wife of former President Rawlings, Nana Konadu Agyemang Rawlings, who’s the leader of the National Democratic Party [NDP], some minority members were heard hooting at her. This appeared to have shocked the President, who perhaps felt that for the sake of the former President and the party Founder; his wife should have been accorded similar respect. The President said “Mr. Speaker that’s the way of the world; the Founder of the party is no longer recognized by the members of the party,” he said. This comment by the President appears to have angered the minority members, who complained for several minutes, before remaining calm for the President to continue his speech. Nana Konadu parted ways with the NDC after she and her husband had repeatedly criticized the two former NDC administrations for dumping the ideals of the party, and allowing corruption to thrive. She eventually led the formation of a new party, the NDP, which contested the 2016 elections, after their first attempt in the 2012 elections failed. She has since not been in the good books of the NDC. President Akufo-Addo has been touting the achievements of his government in stabilizing the economy, implementing the Free SHS and clearing a huge chunk of the debt owed by National Health Insurance Scheme in the past one year. He has also been reiterating the efforts and strategies underway to put the economy on a sound footing, improve agriculture, enhance road network, revive the country’s rail network, the health sector, as well as give real meaning to the fight against corruption.